Looking for new and interesting ways to study the Emancipation Proclamation and the end of slavery in the United States? Look to ProQuest Black Studies Center and ProQuest History Vault. On September 22, 1862, just five days after the bloody Battle of Antietam, President Lincoln issued a preliminary Emancipation Proclamation giving states and territories until January 1, 1863 to stop fighting or lose their slaves to Emancipation on January 1, 1863. The effect of the Emancipation Proclamation was far-reaching, in that it effectively turned the Civil War from a war to save the Union, to a war to end slavery. For students researching slavery, looking for new and interesting ways to study the impact of the Emancipation Proclamation, ProQuest has two major databases that offer researchers a chance to study this important document from a variety of perspectives. ProQuest’s Black Studies Center includes essential background information on the Emancipation Proclamation in scholarly essays, newspaper articles, timeline entries, dissertations, and images. 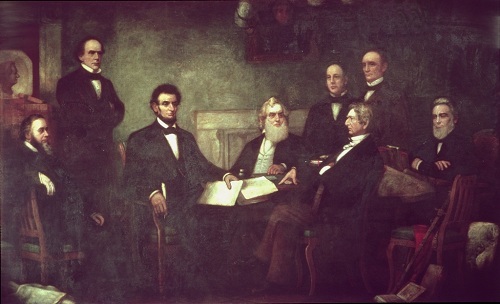 A search on “emancipation proclamation” in Black Studies Center, for example, retrieves images such as a 19th century lithograph of slaves fleeing to the North following Lincoln’s issuance of the Emancipation Proclamation, an illustration from Harper’s Weekly of former slaves coming into Union Army lines in North Carolina, and this well-known image of Abraham Lincoln reading the Emancipation Proclamation to the members of his cabinet. Shortening the search to just “emancipation” yields 31 images, as well as 25 scholarly overview essays, 22 timeline matches to trace the issue of emancipation worldwide, and numerous full-text journal articles, chapter articles, images, and other key documents. One of the images from the “emancipation” search is this 1863 painting by William Tolman Carlton entitled “The Hour of Emancipation." 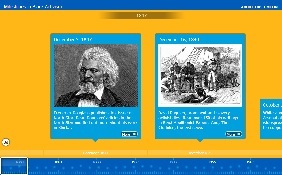 For a different perspective on the Emancipation Proclamation and the end of slavery in the United States, the ProQuest History Vault module Slavery and the Law contains unique and previously hard-to-find documentation, such as petitions to southern legislatures and county courts. These petitions candidly document slavery at the most local level. 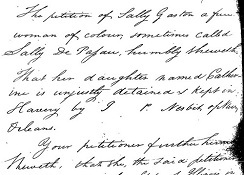 In this petition, shown below, Sarah Allen, a "Light Brown" woman, thirty-two years of age, belonging to J. Pottinger McGill, sought her freedom and the freedom of her three children, William Henry, Anna, and Sarah. In another petition, from A. T. Morris of Brazoria County, Texas, dated May 28, 1866, Morris asks that he be released from the guardianship of Ann McNeel [McNeil] Westall and the administration of the estate of her late father, Henson Westall. Sometimes the cases could be much more complicated. One search result from the Emancipation Proclamation search is a case that originated in 1844 and was not resolved until 1872. In this case, a man named Gideon and twelve other former slaves sought compensation for their work during the time period that their case was being considered by the court. These are just three examples of the very interesting images and source documents in Black Studies Center and the Slavery and the Law module of History Vault. What will you find?